Ale Preise in US Dollars sind pro Zimmer (Einzel- Twinzimmer). In the evening enjoy the pleasure of being able to retire to one of our sea view, spacious and luxurious guest rooms or suites. Specials : All hotel rooms are sea view. 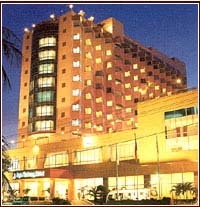 The hotel feature three function rooms 380m2 and 129m2 each. For banquets these facilities can cater to intimate gatherings or larger functions of up to 400 guests. Business center is available for business travellers. The hotel's two restaurants provide Vietnamese, Chinese and European cuisine matched with sincere service. They offer perfect settings for elegant banquets, quiet family meals or private conversation with friends. Health Club : Offering a fully equipped gymnasium, outdoor swimming pool, massage, sauna and jacuzzi allows you to keep up your regular fitness routine or just take time out to relax.